The Genesys CGN00 features Turn/Push button locking. Pushing and turning button will lock the outside lever requiring use of key until button is manually unlocked. Pushing the button only will lock the outside lever until unlocked with key or inside lever is turned. Other features include fixed thru-bolt installation, ADA barrier free compliance, and a clutch mechanism on the exterior lever that will allow the lever to turn freely when locked to prevent breaking the lever. The Genesys Collection offers 4 handle styles and 12 functions. 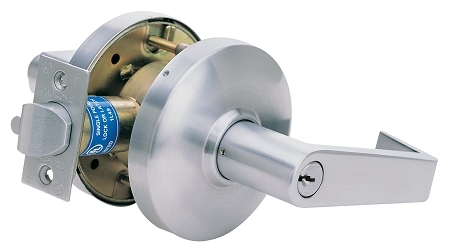 This heavy duty collection has been hurricane approved by Florida Building Codes and features a clutch mechanism on the exterior lever to deter damage when the lever is locked. The Genesys Collection is designed for the high traffic areas of offices, schools, hospitals and other commercial and public buildings. Cal-Royal has focused on providing "Innovative and Value Added" hardware products and accessories to the builders industry since 1983. In accepting this charter, Cal-Royal has continued to be the leader in import hardware. Their product offering is designed to comply with the Americans with Disabilities Act (ADA) and to encompass all levels of ANSI classification, Grades 1, 2 and 3 as well as UL requirements. They offer a complete line of mortise locks, exit devices, door closers, hinges and many other hardware and trim products.